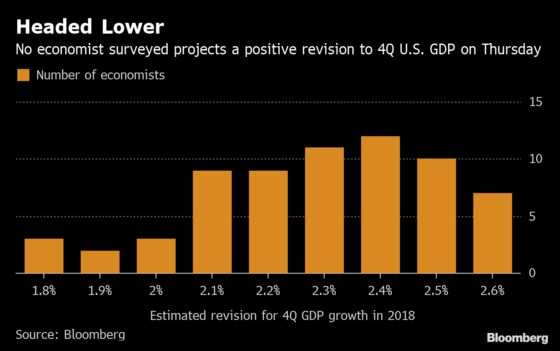 (Bloomberg) -- The U.S. economy may have slowed more sharply than previously reported at the end of 2018, potentially dragging full-year growth below the 3 percent mark that President Donald Trump has boasted about achieving. Economists expect the fourth-quarter annualized pace of expansion to be revised down to as low as 1.8 percent from the original figure of 2.6 percent, according to a Bloomberg survey where the median estimate is 2.3 percent. Reasons include new or revised data on retail sales and construction spending and services. A revised GDP on the weak end indicates the full-year figure of 3.1 percent would be changed to 2.9 percent, according to David Sloan, senior economist at Continuum Economics in New York. While that would still be the fastest for a year since 2005 -- as measured on a fourth-quarter-over-fourth-quarter basis -- the 3 percent level is “psychologically significant,” he said. It’s more than just political. A downward revision would indicate that the economy had diminished momentum heading into 2019, when various indicators in housing and manufacturing have been showing additional weakness. Federal Reserve policy makers last week lowered their outlook for growth this year and next as they projected no interest-rate hikes for 2019. “If you’re looking at a 2018, a lot of that was fiscal stimulus so it’s like a sugar high: You get a boost and it wears off,” said Bloomberg Economics economist Tim Mahedy. At the same time, the underlying fundamentals of the economy look strong: The labor market is solid and levels of consumer sentiment remain elevated, though “that was true before Trump became president,” Mahedy said.